Cartoon characters were also popular images for nose art and inspired airplane names, such as Super Wabbit, Ruptured Duck and Thumper. The characters reminded soldiers of home and gave them a distraction from the fight at hand. Even the Walt Disney Company created insignias for military planes. By the end of WWII, Disney’s five-man staff had completed over 1,200 insignias. Movie starlets like Rita Hayworth were commonly featured on WWII aircraft and acted as muses for much of the era’s popular art. During the Vietnam War, however, nose art dramatically shifted to focus on rock music in part because of society’s shift in attitude. 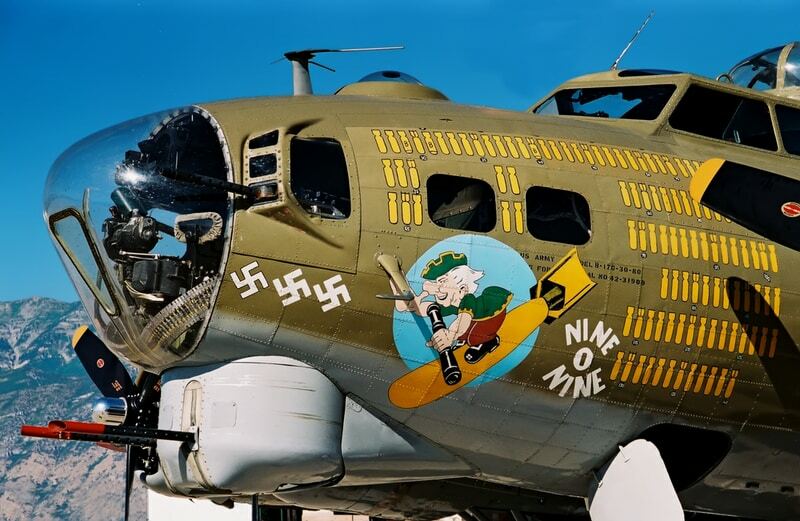 Observe historical aircraft nose art in-person at the Warhawk Air Museum in Nampa, Idaho. Since 1989, we have worked diligently to preserve history and educate future generations about American veterans and their contributions to our country. We hope you will come visit us and see for yourself! Contact us for more information or to schedule a tour.